All baseball fans know about Charlie Finley's orange baseball, one in a long string of (if you'll forgive me) colorful ideas from the man who brought you white cleats, moustachioed players, and mule mascots named after the owner. 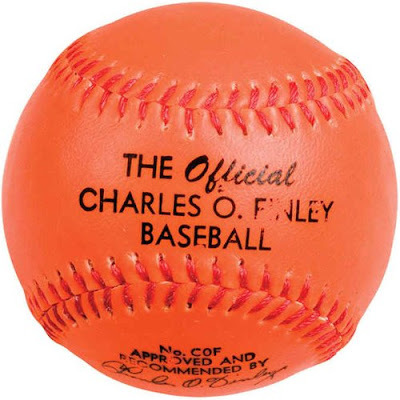 Finley thought that the orange baseball's increased visibility would boost batting averages and home runs, sparking increased interest in the game. 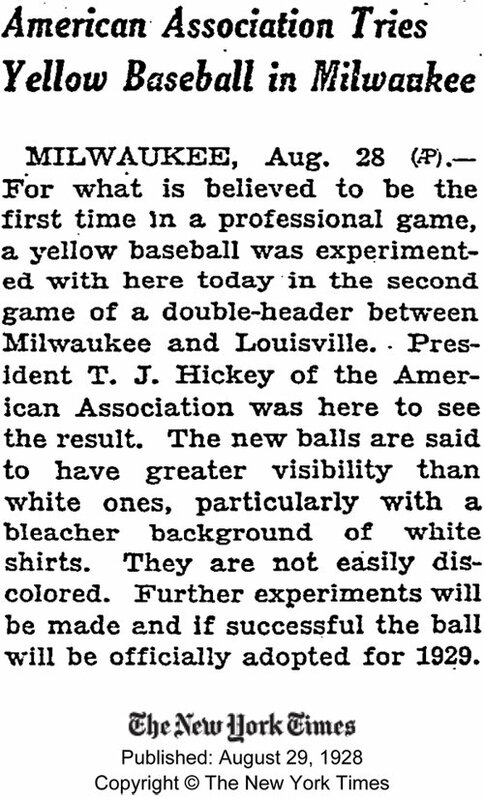 Similar experiments were conducted in 1938 by the Brooklyn Dodgers (in the first game of a doubleheader against the Cards on August 2 of that year), and by Columbia University (against Fordham on April 27th). 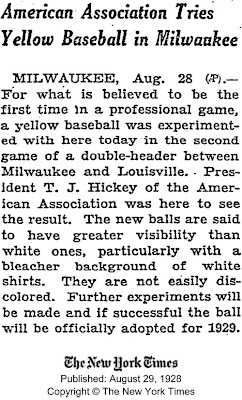 Like Finley's "alert orange" ball, the yellow baseball came and went, failing to dethrone Mr. Spalding's classic white ball. The idea would eventually take hold, but in an altogether different sport. On November 17, 2004, the US Mens National Soccer team played a World Cup qualifying semifinal match against Jamaica using Nike's "Total 90 Aerow Hi-Vis" ball, which was designed to provide maximum visibility through its distinctive yellow color. The ball was subsequently adopted by the Premier League in England, where the basic design continues to be used in winter months. So Finley was in a sense on to something. Still mad about the DH, though.